The word "rhombus" comes from Greek ῥόμβος (rhombos), meaning something that spins, which derives from the verb ῥέμβω (rhembō), meaning "to turn round and round." Our life is just like the meaning of rhombus, which is why we add the shape of rhombus to the design of our apple watch bands. Notice: Because of the different monitors in each computer, the pictures and objects will be slightly different. Hope you could understand. - Rockvee band is made of premium stainless steel. 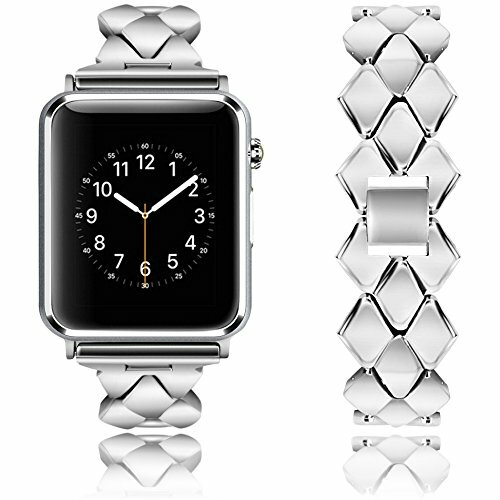 Metal diamond links unique design for Apple watch band, bring you the ultimate elegance. It is suitable for many occasions, such as formal occasions, weddings, parties, etc . - 6.9 - 8.3 inches wrists. In addition, You can adjust the length of the strap at will by means of a tool (we offer this tool free of charge and 2 replacement pins in the bottom of the tool). - Our company provides customers with warrantly of 18 MONTHS from the date of purchase. - Search "Rockvee Band" for more bands and accessories offered by Rockvee store. Fit Size: 6.9 - 8.3 inches wrists. Perfect fit for Apple Watch Series 1 / 2 / 3, Apple Watch Nike+, Apple Edition. Premium Design: Comes with unique rhombus shape design and made of high quality stainless steel. make your iWatch look special, bring you tons of compliments on how nice it looks. Adjustable length: Slid in - Slid out installation. You can adjust the length of the strap at will by means of a tool (we offer this tool free of charge and 2 replacement pins in the bottom of the tool). Warranty: For 18 months after the date of purchase, we take care of all quality-related issues with a REPLACEMENT or REFUND. Pls contact us at the first time if you got the defective item from our store.